101. How to force lead assignment rule via Apex while updating or adding the Lead? Set the “useDefaultRule” property of “assignmentRuleHeader” to True. Finally call a native method on your Lead called “setOptions”, with the Database.DMLOptions instance as the argument. 102. 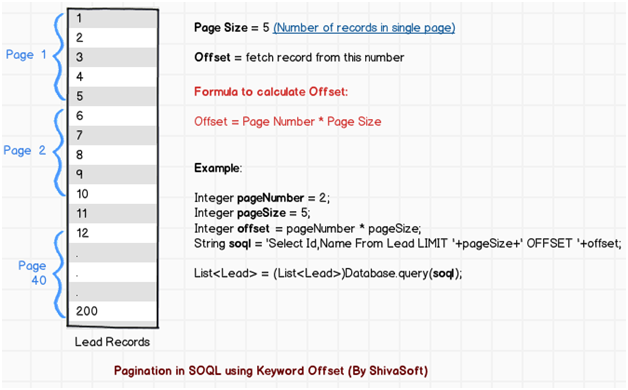 How to implement the pagination in SOQL ? In spring 12, Salesforce has come up with ability of SOQL to get records from position “X” instead of position “1” every time to help creating pagination feature. Above query will return 5 Lead records starting from record number 10 (5×2). 103. Access custom controller-defined enum in custom component ? We cannot reference the enum directly since the enum itself is not visible to the page and you can’t make it a property. 104. How to generate the random string or random password using Apex? 105. What is dynamic binding in salesforce? Dynamic Visualforce bindings are a way of writing generic Visualforce pages that display information about records without necessarily knowing which fields to show. In other words, fields on the page are determined at run time, rather than compile time. This allows a developer to design a single page that renders differently for various audiences, based on their permissions or preferences. Dynamic bindings are useful for Visualforce pages included in managed packages since they allow for the presentation of data specific to each subscriber with very little coding. Access the Account name from Contact. 106. How to convert lead using Apex? 108. How can you determine that email is actually sent or not from the salesforce? There is an Email log that you could use. It’s available in the setup menu under Monitoring. It’s only for the past 30 days and you would have to manually check it. 109. In salesforce which fields are indexed automatically? Custom fields marked as External ID or Unique. 110 : Give any scenario when you cannot change the currency field type to numeric type. Ans : When the field is used either in Apex class or trigger. End_date__c field it has to show last day (date) of that week .how can we code this. I found a website with link For complete training videos on Dev 401 and Dev 501. Hope it Helps and its Free.Please check. OFFSET query example will result 3-7 I believe. Please correct me if I am wrong. great blog bro… Learnt a lot from your blog. thanks a lot for sharing your knowledge.